Last year, I was checked up on Aesop Rock's page and the album cover for FELT was the profile pic. So, I looked into it, but before I downloaded the album, I didn't know that Slug & MURS officially teamed up. What's worse is they had already made two albums before I heard anything about it! Well.....the name of their group is FELT. I had obviously heard of Slug, but never really got into Atmosphere. It's odd because they are the most popular hip-hop group in and from the Minneapolis/St. Paul area. Minneapolis/St. Paul (aka the Twin Cities) has its own small underground hip-hop scene. If I had to generalize the scene, its blue collar, smart, story-telling lyrical style and the music is diverse but it’s raw, grass roots and instrumental. After grabbing this album, I figured out what prevented me from getting into Atmosphere. Slug is a talented MC. Don't get me wrong. The thing that bothered me was when he would sing. He "sings" for a lot of the choruses and they usually continue the story until the next verse. I couldn't put my finger on it before. But now that I have figured that out, it doesn't bother me anymore. I like K-Os (Toronto) and sometimes he sings. I don't always like when K-Os sings, but it doesn't bother me. I have come to expect it from him, so don't let it prevent you from grabbing this album. MURS & Slug make a good team. I have been a fan of MURS for a while and they complement each other well. MURS is from LA & you can tell in his flow and in his accent. There's times when I think I hear Del, but its definitely 100% MURS's west coast flow. I don't say that to typecast MURS, but it’s common to pick up on regional similarities if you listen to hip-hop from different parts of the country (or world). I walk away from this album being impressed by MURS lyrics. I think he has improved a lot. 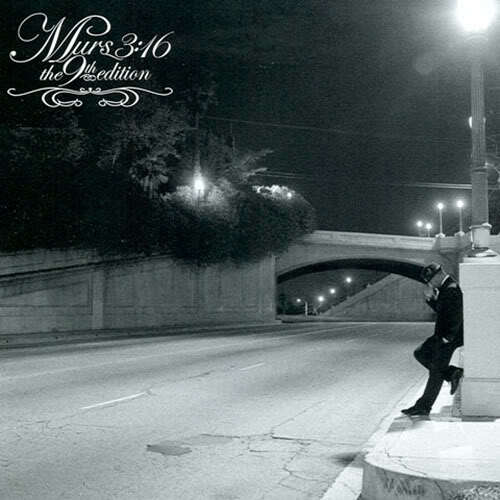 MURS: 3:16 was a great album and it put MURS on the map. I knew then that he was talented. In the fall of 2005, when I was in Paris, I was surprised to hear Bad Man in a cafe near Notre Dame. I was shocked because it wasn't edited and everyone in the cafe didn't even look surprised by it. But his lyrics on this album have moved him up in my top mc's list. Slug has a completely different style. Slug fluctuates the pitch of his voice up and down more than most mc's on the east coast. He's a good storyteller and his lyrical talents earned the hip-hop worlds respect. Slug is from Minneapolis and he represents it often. A lot of people in NYC don't know where Minneapolis is or what state it's in. So I gave up explaining to people where it is. I just say, "Northwest of Chicago!" Anyway, Slug is one half of Atmosphere. The other half of Atmosphere is Ant (as corrected by Kris)......my bad. They run Rhymesayers and are affiliated with Brother Ali, Aesop Rock, Def Jux and a long list of other performers. They can pack 1st Avenue with loyal fans whenever they feel like it. 1st Avenue is the club where Prince filmed a good portion of Purple Rain in downtown Minneapolis. Also, it is a really good venue for music. I have seen Erykah Badu (performing Mama's Gun) Mos Def (performing as Black Jack Johnson) at 1st Ave, among others. 1st Ave also has other genre performing all of the time. The monthly schedule always has a diverse line up. If you're ever in Minneapolis, it’s worth it to check out who is performing. After listening to this album a couple more times, I realized that I just found another great album. MURS, Slug and Aesop Rock make a great team. They can switch from tag team, individual verses, solo songs or instrumental tracks seamlessly. The tracks from Aesop add a diverse, quirky and complimentary bonus that completes the trio. An easy way to tell that I think it’s a great is that I have 16 out of 21 tracks as top tracks. STYLE As a group, the style is balanced, down to earth, proud to be indie, real life and deliver nothing to prove lyrics. They rap about anything from the music industry, girls, relationship, partying, tour stories, fictional stories or fan appreciation. They're diverse and accessible, but their lyrics are not simple or elementary though (and never commercial). They can appeal to people that typically don't like hip-hop as well. You won't see them on TV much, so to stay up to date on them, follow them online with social media. From what I understand, they have guest producers for each FELT album. Listening to the combination of bass lines, dirty drums, random voice samples, scratching, synthesizers, voice effects and heavy, head bobbing beats, it makes sense that Aesop Rock produced the album. Listen to None Shall Pass and you will know what I'm talking about. Aesop Rock didn't produce all of None Shall Pass, but you will see what I mean. Aesop Rock is one of my favorite artists. He has a unique voice, rhyming style and sound. He adds some vocals to the chorus of Give It Up, but he doesn't have a verse in the 21 tracks.